This soft oatmeal raisin cookies recipe uses simple ingredients that you probably have in your pantry. 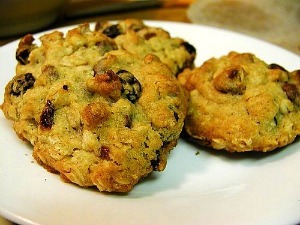 The combination of oatmeal and raisins makes this cookie a healthier choice of sweets. Brown sugar in this old fashioned oatmeal cookie recipe keeps the cookies soft and moist, while giving them a subtle taste of molasses. A recipe for oatmeal cookies loaded with raisins, these drop cookies are a classic. 1. Preheat oven to 350 degrees. Lightly grease cookie baking sheet(s). 2. Sift flour with baking powder, salt, cinnamon and nutmeg. Set aside. 3. In a large bowl, stir butter and sugar together until just mixed. Blend in flour mixture, oats, eggs and vanilla. Stir in raisins. Drop by rounded teaspoonfuls 2 inches apart on baking sheet(s). 4. Bake 12 to 15 minutes until lightly browned and tops spring back when touched. Remove from oven and place cookies in a single layer on wire racks to cool. Store cooled cookies in an airtight container.